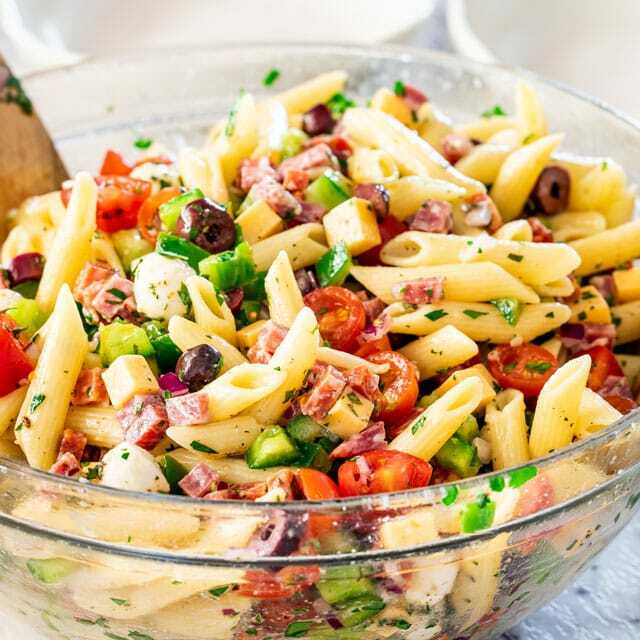 This Italian Pasta Salad is what everyone needs in their go-to recipe arsenal for quick and easy recipes ideal for a potluck, picnic or any other summer get-togethers. It’s healthy, it’s fast, super easy to make, delicious and bursting with flavor. 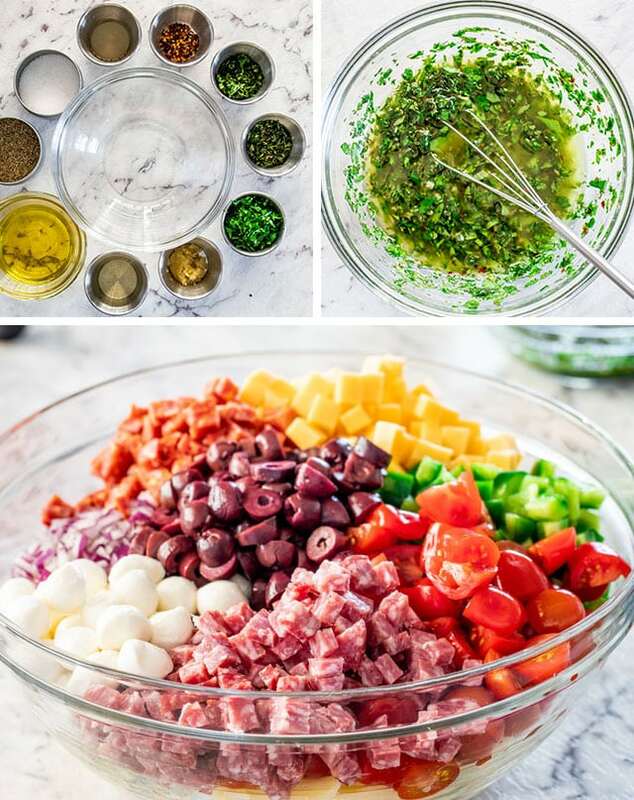 I love making pasta salads, especially this Italian Pasta Salad which really is one of my favorite cold pasta salad dishes. Not only is it delicious, but it’s really easy to put together and super simple to make. Even though I love creamy pasta salads, not all pasta salads have to be mayo loaded. Which is why I love a good Italian pasta salad. The dressing is refreshing and loaded with fresh herbs. While most people only make pasta salads when attending a potluck, picnic or going to some family/friend gathering, I think they are great for a weekday meal. They make a perfect lunch or dinner. Not to mention the leftovers, because you will have lots of leftovers. But don’t worry, this pasta is even better the next day. This pasta salad is one of the easiest pasta salads you can make. First cook the pasta in a pot of boiling water according to package instructions. Next make the dressing by combining all the dressing ingredients in a bowl. Chop the rest of the ingredients, pour the dressing over the salad ingredients and toss everything together well. That’s all there really is to it. This salad will last in the fridge for 2 to 3 days and it’s even better the next day! I would recommend refrigerating it for at least an hour before serving. Choose the right pasta and cook it properly. Use bite-size pasta such as penne, rotini, fusilli, farfalle, small shells, or even elbow macaroni. For 1 pound of pasta cook it in 1 gallon of boiling water seasoned with at least 2 tablespoons of salt. Cook it until tender and when it’s done, drain it, but do not rinse it. Load it with lots of veggies and salami. You want about 2 pounds of main ingredients. Choose good Italian salami, like Genoa salami and mix it up with both mild and spicy salami. 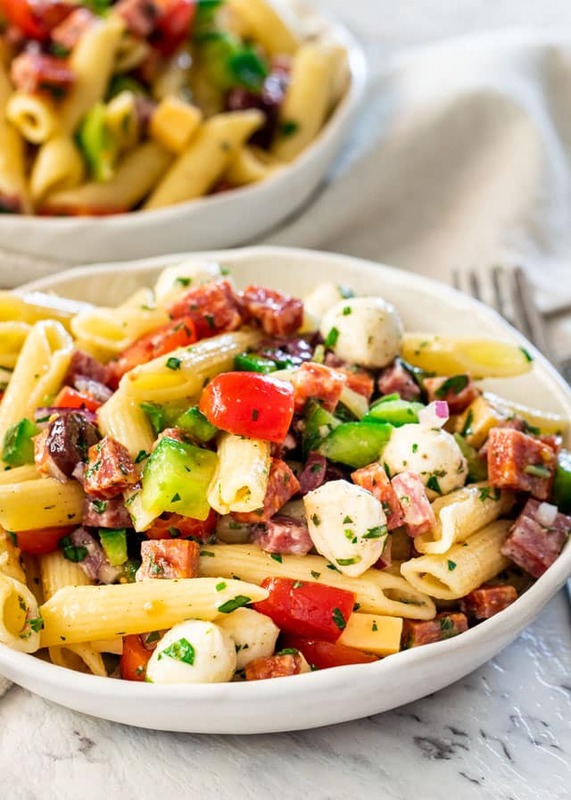 The spicy salami will add a great kick to the pasta salad. Load it up with veggies such as bell peppers, cherry tomatoes and good olives. You could even mix it up a bit by adding veggies like asparagus, or snow peas, even zucchini and broccoli. Don’t be afraid to experiment and try different veggies. Load your pasta salad with fresh herbs and onion. Go with lots of fresh herbs, such as parsley, oregano, and basil. While dried herbs work as well, nothing beats fresh herbs. As far as onions go, while I chose red onion, green onions are great as well. Dress it up! For all this pasta salad, you’ll need about a cup of dressing. For best results, use a mild white wine vinegar, rice vinegar or lemon juice. I don’t recommend balsamic vinegar as it will turn the pasta brown. 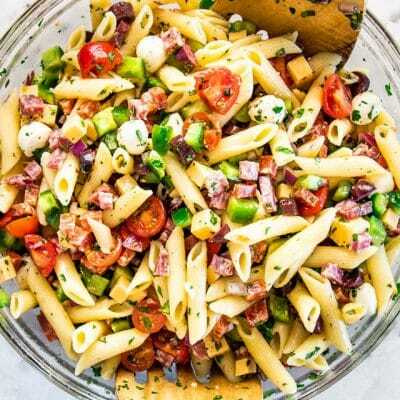 This Italian Pasta Salad is what everyone needs in their go-to recipe arsenal for quick and easy recipes ideal for a potluck, picnic or any other summer get-togethers. It's healthy, it's fast, super easy to make, delicious and bursting with flavor. Cook pasta: Cook the pasta according to the package directions. For 1 lb of pasta you will need about 2 gallons of liquid, also make sure to salt your water well, at least 2 tbsp of salt. After you drain the pasta do not rinse it, if anything add a little olive oil to it to prevent it from sticking together. Combine salad ingredients: Toss all the pasta salad ingredients together. Prepare salad dressing: In a small bowl or jar add all the dressing together and whisk well. If using a jar, put the lid on and close it, then shake well. You want the dressing to emulsify a little bit, this will ensure the pasta will absorb the dressing. Toss and serve: Pour the dressing over the pasta and toss well. Chill for at least 1 hour before serving. Cheese: I used mini bocconcini, but regular mozzarella cut in cubes can be used as well. Another alternative to Monterey Jack cheese could be a marble jack cheese, or a sharp cheddar cheese. Leftovers: Store in an airtight container in the fridge for 2 to 3 days. This salad is even better the next day. Nutrition: This salad will yield about 15 cups, so nutritional information is based on a little over a cup per serving. Please keep in mind that nutritional information is a rough estimate and can vary greatly based on products used. 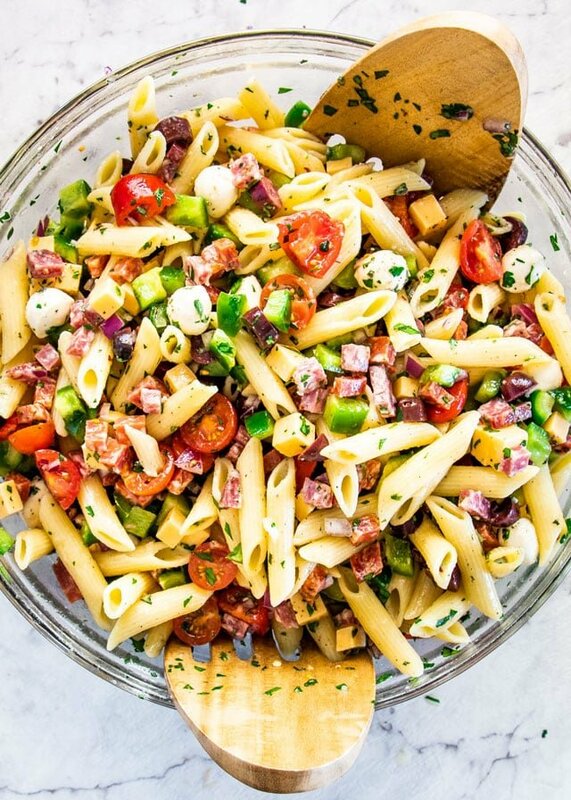 Delicious pasta salad! I have made it a few times for family and work potlucks and the compliments are always pouring in! Thank you for this recipe. This salad was delish! Added more garlic and chopped snow peas and substituted mozzarella with a Romanian semi soft sheep cheese. Kids devoured it! Can’t wait to make this again. I tried this recipe and the hubby and I loved it. Lovely to add a mayo-free pasta salad recipe to my recipe box. Thanks for this one! I love toasted pine nuts in this kind of salad.